Bring the entire family to Harmony on Saturday, April 5 for a morning filled with Easter fun and games, pictures with the Easter Bunny and more! Join us from 9 a.m. – noon for face painting, arts & crafts, a D.J. and fun contests. We’ll have pictures with the Easter Bunny in Harmony’s Ashton Woods model home and complimentary breakfast in the Village Builders model. 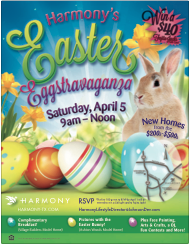 Harmony’s Easter Egg-Stravaganza is free and open to the public . . . so don’t miss out on the fun! View event flyer here, or click below.